Summit, the US's new supercomputer, is more than twice as powerful as the current world leader. The machine can process 200,000 trillion calculations per second - or 200 petaflops. China's Sunway TaihuLight supercomputer, until now the world's most powerful machine, has a processing power of 93 petaflops. Summit's initial uses will include areas of astrophysics, cancer research and systems biology. It is housed at Oak Ridge National Laboratory (ORNL) in Tennessee, where it was developed in partnership with IBM and NVidia. Supercomputers are typically large, expensive systems featuring tens of thousands of processors designed to carry out specialised calculation-intensive tasks. 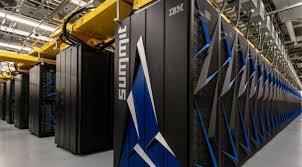 Summit contains 4,608 compute servers and has more than 10 petabytes of memory. ORNL director Dr Thomas Zacharia said in a speech to mark its launch on 8 June that Summit had already been used to run a comparative genomics code while it was being built. "Literally as the machine was being assembled they were getting on the machine and running," he said. "Imagine [driving a] race car while you're putting the tyres on." In the most recent chart of the world's top supercomputers, published in 2017, the US owned 143 of the top 500 while China owned 202. The US's previous fastest supercomputer, Titan, was ranked fifth. "We know we're in a competition and it matters who gets there first," said US Secretary of Energy Rick Perry, speaking at the ORNL event. "The ability to show the rest of the world that America is back in the game and we're back in the game in a big way is really important. "Summit's computing capacity is so powerful that it has the ability to calculate 30 years' worth of data saved on a desktop in one hour... this is about changing the world."